This article shows how to use SQLite with ASP.NET Core 2.0 using Entity Framework Core. EF Core can now create SQLite databases using Entity Framework migrations which was not possible in previous versions. The project was created using Omnisharp generator-aspnet and then upgraded to version dotnet using the command line tools dotnet, and then upgraded to VS2017 csproj. The required dependencies are added to the AspNetCoreSQLite.csproj file. This is the hardest part, as you have to figure out which packages are required and also if the packages work together. Next step is to create the POCO classes and the Entity Framework context. This is a simple class with a Id of type long. The context is defined with a single DbSet and a key mapping. Entity Framework is then added in the Startup class. The SQLite Provider is used and the connection string defines the path to the SQLite file. The connection string is defined in the config.json file in this application. It is important to define the path as shown below ‘C:\\…’, otherwise the application will not work. Now the database can be created using EF migrations. Open the command line and execute the following command in the src directory of the application. Note: At present the EF Core migrations do not work with msbuild. Due to this, you need to use the old project.json file as well as the global.json to do the migrations from the command line using dotnet. The context can now be used. A simple repository has been created for the CRUD operations. The default IoC from ASP.NET 5 is used to define the dependencies in the startup class. The DefaultContractResolver needs to be set if your using Pascal case json. The server side of the application is up and running and CRUD operations function with an MVC 6 application using Entity Framework code first with SQLite. A simple angular client application has been created to test the CRUD operations. It is now much easy to set up a SQLite database in Entity Framework compared to previous versions, and once the initial bugs from the migrations are sorted, this will a great solution for certain problems, application types. SQLite doesn’t support concurrent inserts or multi-threading (unlike SQL Server CE) and the whole database file becomes locked for each operation. It needs explicit locks in the codes, otherwise you will get ‘Database is locked’ errors. Thanks for the comment. This would make SQL Server CE the better choice if you had this requirement. I would need to implement this, if I used a Scoped instance in a real production application. Thanks for this. Would a relative path for the db connection string be possible? At present not, but I’m guessing this will work in the next version. Maybe you could create a gitHub issue. 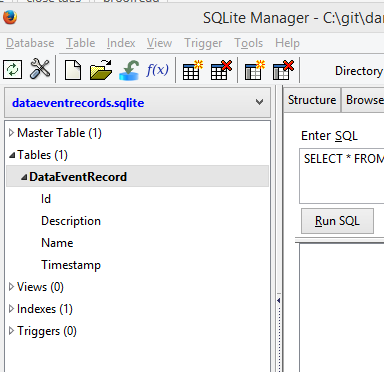 Sqlite work with x64 architecture.